In this blog post, Chicago plastic surgeon Dr. Mohammed Alghoul discusses common causes of droopy eyelids and how he can treat the condition. Droopy eyelids are common among many older adults. This is because as we age, the muscle responsible for lifting the eyelid (the levator) becomes stretched out or simply loses its ability to properly lift the eyelid. In addition, the body produces less collagen and elastin (two proteins responsible for keeping the skin smooth and tight) over time. 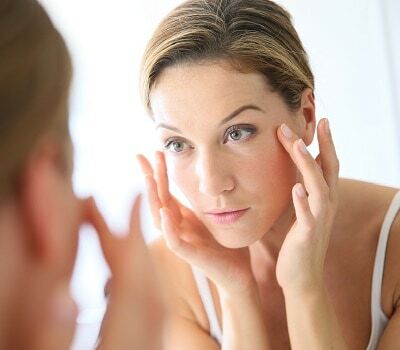 This causes the skin on the upper eyelids to loosen and sag. Some babies may be born with ptosis due to naturally weak levator muscles. Congenital ptosis is a rare condition that prevents babies and children from opening their eyelids properly. If left undiagnosed or untreated, children with congenital ptosis may have difficulty seeing properly and, as a result, experience difficulties learning at school. Eyelid ptosis may be a symptom or result of a medical condition. Benign conditions that can cause eyelid ptosis include a stye, an acute infection that causes inflammation and redness in the upper and/or lower eyelids. Serious medical conditions that can lead to drooping of the eyelid include stroke, diabetes, abnormal growths and a tumor around or behind the eye. Neurogenic ptosis occurs when there is a problem with the nerve pathways that control the lifting and movement of the eyelid muscles. Causes of neurogenic ptosis include Horner syndrome, myasthenia gravis and third nerve palsy. Droopy eyelids may occur as a rare side effect after undergoing eye surgery as a result of the retractor that is placed to keep the eye open during surgery. Treatment for eyelid drooping depends on the cause and severity of the condition. During your consultation, Dr. Alghoul will evaluate your condition and full medical history. The doctor may also conduct or request additional testing. If disease is detected, it must be treated. For cosmetic and functional eyelid drooping, Dr. Alghoul may recommend eyelid surgery. Eyelid surgery aims to remove excess skin and tissue on the upper eyelid and raising and tightening the underlying eye muscles. With eyelid surgery, unobstructed vision is restored, and a youthful and energetic eye appearance is achieved. The exact techniques and details of your eyelid surgery will depend on your unique case. For more information about ptosis or eyelid surgery, please contact Dr. Alghoul’s Chicago office by calling (312) 695-3654 today.